This year's tomato raising resulted in around 90-100 seedlings. Around two weeks ago, natural attrition had reduced this to 86 seedlings. I planned to only keep around 10 for our plot, so 70+ seedlings needed to find new homes. A stock take revealed I still had 28 plants I didn't want to keep. The solution? Put them out the front with a sign saying "Free Tomatoes" and see if anyone will take them. Sign writing credit goes to the Cunning Plans Dept who thought it might be wise to put some kind of limit to remind people that taking all of the seedlings at once may be greedy (trying to encourage community sharing etc..). We also made sure that the boxes we put them in were old cardboard boxes we wouldn't miss if they were taken or damaged. We put the seedlings out on Saturday 31st, thinking that perhaps if there was anyone out trick or treating for Halloween they may wish to add some tomatoes to their booty. By Sunday evening, 4 seedlings had gone. When we got up on Monday morning and went out, the whole lot had gone. Boxes and all. At least they left the sign! 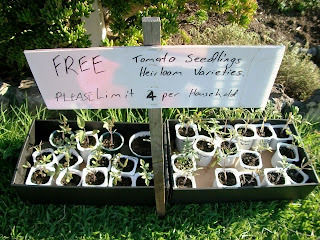 While the point of putting of the tomatoes out the front was to give them away, I'm a little disappointed that someone took 24 seedlings, and the boxes, in one go. I'd like to think it was an enthusiastic gardener, but I have a sneaking suspicion that it is more likely someone who will probably try and sell them at the markets to make a quick buck. I guess even then they'd still eventually end up in someones garden.